Verona, Wisconsin, November 17—Return and repeat. 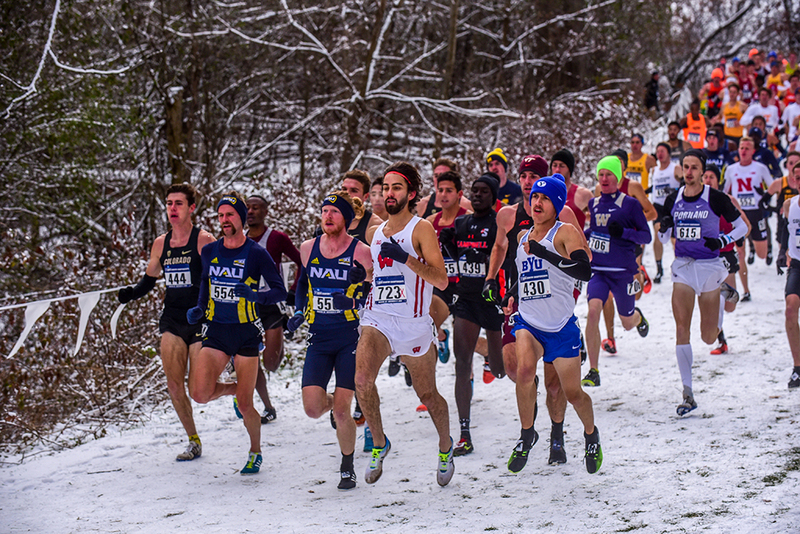 Those 2 R’s are the simplest way to summarize the NCAA Men’s Cross Country Championship in its 80th anniversary year as Wisconsin senior Morgan McDonald returned to glory and Northern Arizona repeated its glory. McDonald redshirted last fall so he’d have a chance to return in his fifth year for the NCAA on his home course. Return he did, and win the Australian also did, becoming the first man to win on his home course since Indiana’s Bob Kennedy in ’92. And the Lumberjacks returned to the top of the podium as they accomplished the “three-peat,” becoming the first team to do so since Arkansas 1998–00. But it was no sure thing for McDonald, who had to out-sprint to the line another strong kicker, Stanford senior Grant Fisher, for the win in 29:08.3. Fisher was a half-tick back, with Iowa State’s Edwin Kurgat on his heels in 29:09. The finish was testament to the way the race started, with the first 10 finishers within 9 seconds of the winner. But the major players were all in evidence early, even though the size of the lead “pack” was well into double figures over the snow-covered route. At the forefront from the get-go were the NAU duo of Tyler Day & Matt Baxter, the Colorado trio of John Dressel, Joe Klecker & Ryan Forsyth along with the eventual top 3 and BYU’s hard-grinding frosh Conner Mantz, who had showed at Pre-Nats here that he’s not afraid to lead. 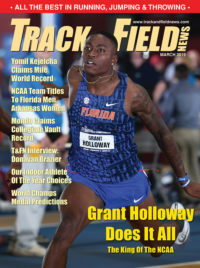 But as is so often the case, it came down to a kick on the long upgrade to the finish, with McDonald breaking away slightly over the final 100m to the partisan roars of perhaps the largest crowd ever at an NCAA meet and then holding his edge to the line over the fast-closing Fisher. NAU, as has been its wont over the last 3 years, was routing the field early, with 82 points at 2K to Portland’s 136. So it was virtually over that quickly. With 5 in the top 20 early on, NAU never faltered despite an “off” day from Matt Baxter, last year’s runner-up who fell to 15th. No matter. The depth of coach Mike Smith’s team carried the day again with an adjusted 5-12-19-22-25 finish for 83 points, good for a 33-point edge on Mountain Region rival BYU (116). Portland was 3rd with 160, followed by regular top finishers Colorado (178) and Stanford (201) in the 31-team field. 22. Princeton 557; 23. Villanova 577;24. Bradley 580; 25. Arkansas 602; 26. Syracuse 603; 27. Texas 630; 28. Iona 634; 29. Purdue 702; 30. Tulsa 777; 31. Florida State 845.